Who woulda thunk? 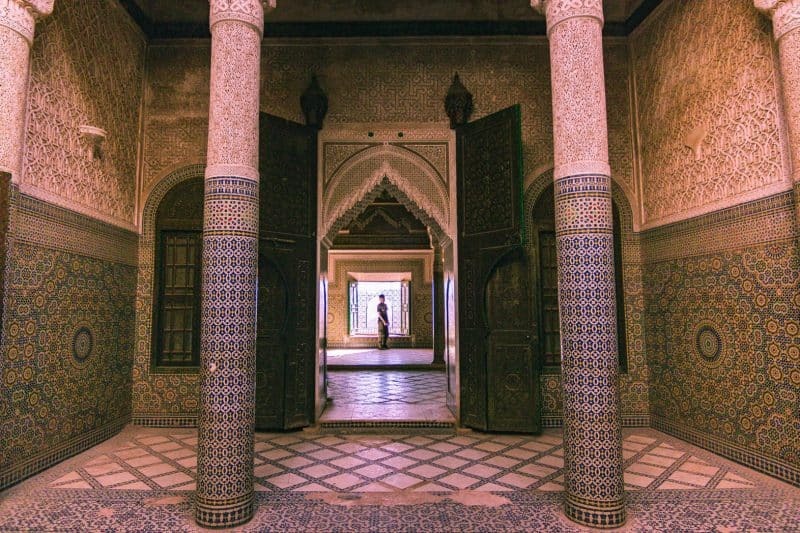 Morocco has a mini Hollywood! 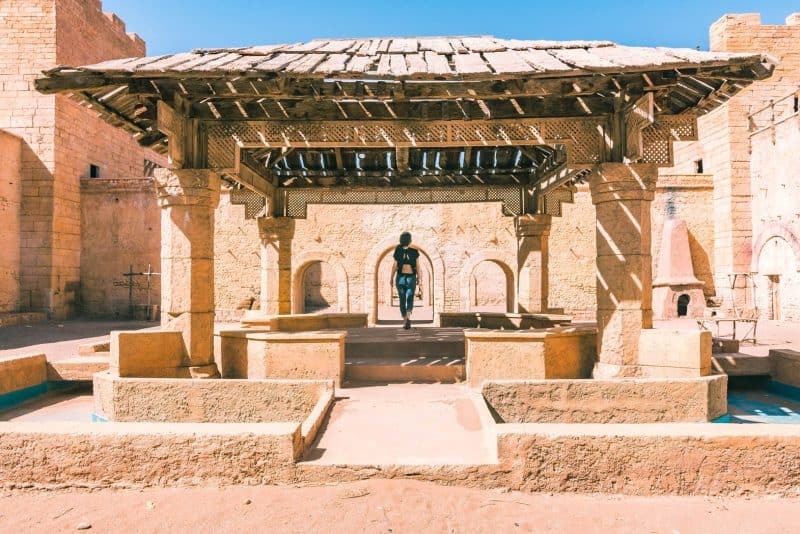 Almost all of the things to do in Ouarzazate have some connection to a film set, which made for an interesting place to discover during our road trip around Morocco. 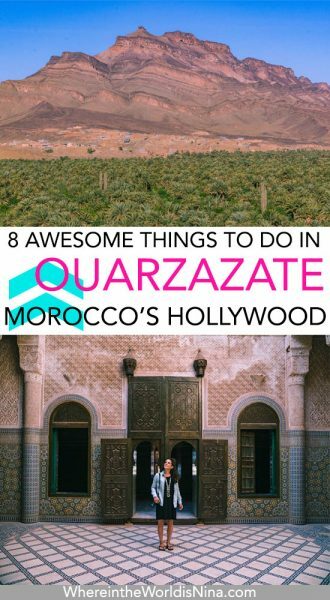 Here are some cool things to do in Ouarzazate to keep you busy and even a few options just outside the city which are worth a visit too. A fake gas station from the movie The Hills Have Eyes 2. Movie buffs may not have enjoyed the actual movie (terrible ratings! ), however, they may enjoy the novel experience of roaming the old gas station that was used. We didn’t know what we were seeing when we drove down N10 and saw this but it’s worth a quick stop to check out. It’s only about 40 minutes or so outside of Ouarzazate. Just passed Ait Benhaddou is a very much less crowded Kasbah, Tamdaght. The views from the street are great as is. The closer you get, though, the more you’ll get hassled for a guide inside or a camel ride. However, if you stay at the Hotel Kasbah Ellouze you can enjoy it for as long as you’d like! The area has appeared in many films including Alexandar the Great. 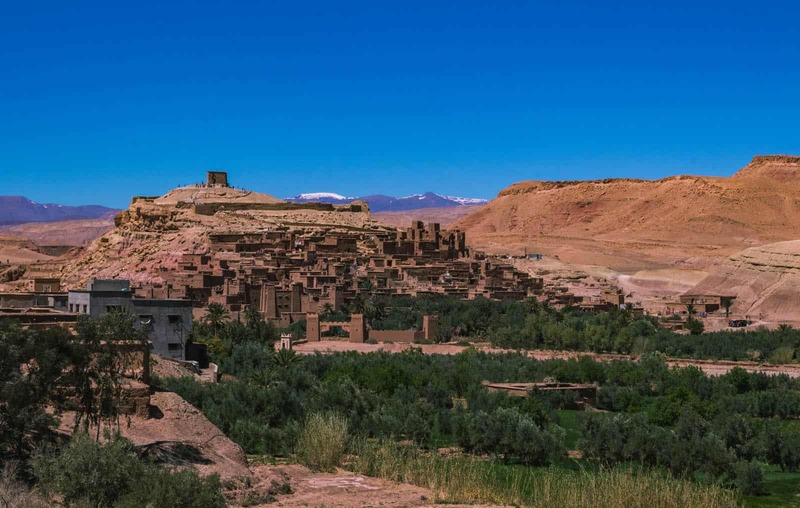 Kasbah Tamdaght is certainly a much less crowded thing to do in Ouarzazate. We were almost sorely disappointed with this place. The actual CLA Studios is nothing special at all. They tried to get us to have a tour guide, apparently at no extra cost (but I didn’t buy it—not pun intended) to show us around a tired looking studio complex. There’s a museum with some props (yawn), a literal empty room that they set up for certain films, and a fake boat once used in some other film… I wasn’t interested. What we came here for was to wander a set from many movies (over 200), but most famously, Game of Thrones. Luckily, we were directed there after they saw we were not interested in the CLA complex. We got back in our car and drove behind CLA Studios to get to the set where a man checked our tickets. Then, it was our playground! Nobody was here (we got here around 9:30-10 AM) and we literally climbed and wandered for a few hours without another soul around us. This spot was seriously cool and we got to have our own little photoshoot without anyone telling us what to do, where to go, or to get down from anywhere. Just be careful, the backstage is a jumble of scaffolding, broken ladders, and steep steps. When driving up to this set, there’s another one just to the left which is closed, but you can wander around the outside of it. It’s been a set for some local Moroccan movies. Unlike Paradise Valley’s Oasis, this one was way less crowded. However, it also lacked the cool blue pools to jump around it. The water levels were quite low but the surroundings were still lush. Fint Oasis still feels quite local. There were families at the river washing their clothes and not a major tourist hub in site. 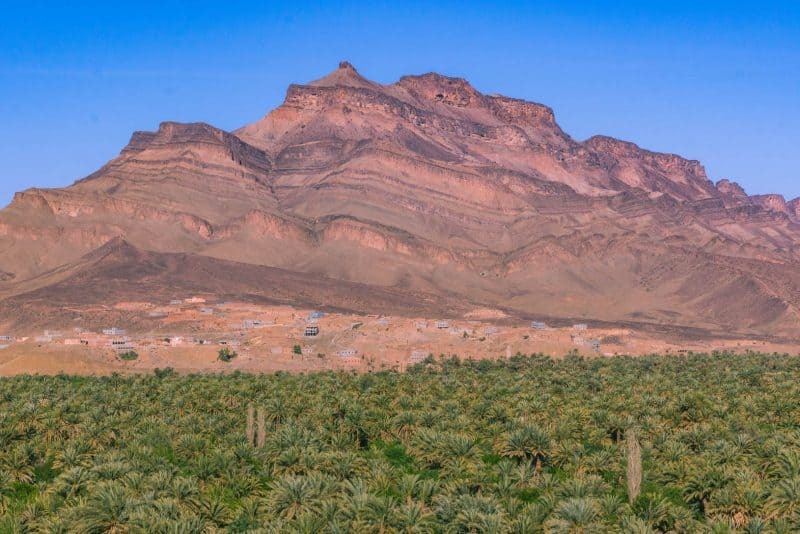 As you wander around the old Kasbah, not the actual village of Fint, look out for the large rock that you can walk up to get a great view of the oasis. Something to note, you don’t need a guide. There are people around the village who will try to get you to go on a guided tour around the area, however, it’s completely unnecessary. Be aware there is a dusty rocky road to get out here but a 4WD is not necessary, just drive slow. This is yet again, another area that has been a film set location! 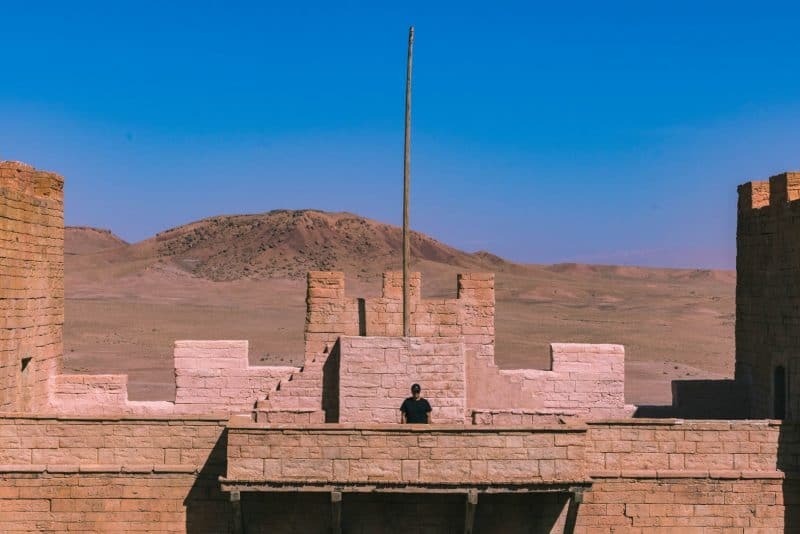 Movies like Babel, Prince of Persia and Kingdom of Heaven were all shot here. If you don’t want to leave, La Terrasse des Delices is a remarkable place to stay set right in the oasis! For a day trip option, if you have a car, you could drive around Agdz which is known to be a chilled out oasis town. And it, in fact, is! The whole town is backed by a massive mountain with the base being covered in palm trees. There’s a nice viewpoint at this unnamed area. The views in Agdz were seriously dramatic! Should you want to stay in Agdz, we were very close to booking a room at Lodge Hara Oasis, it’s GORGEOUS. No films were made here but the backdrop is certainly worthy of being in one. We met some friends who loved their stay but we had to move along on our trip to make sure we made it to the desert in time. If you’re not “Kasbahed out” you can visit this one just across from CLA Studios. Lawrence of Arabia and Jesus of Nazareth were both filmed here. 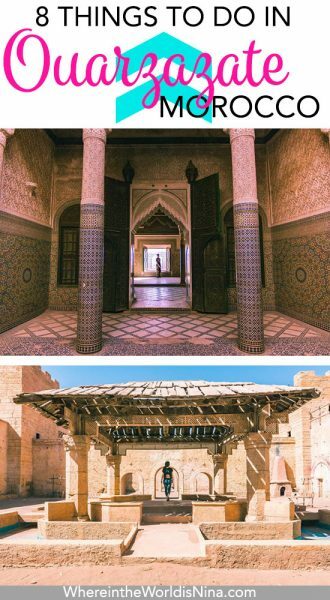 A small portion is restored and you can stay at Kasbah Zitoune just behind it so you can marvel from outside your room. The area is beautiful and you’ll be just outside the bustle of Ouarzazate. Eh, I don’t get it? Maybe because I’m not a huge Game of Throne’s fan, which is what really put this place on the map, or…? But I don’t get the hype. This spot is thronged with tourists and was probably the most touristy thing our eyes saw in the entire 2.5 months we visited the country. We went to the viewpoint which was decent enough, however, a “snake charmer” came out to entertain the tourists there and that was it for us. I may have mumbled under my breath to the tourists taking photos of this to not support it, got in the car, and left. 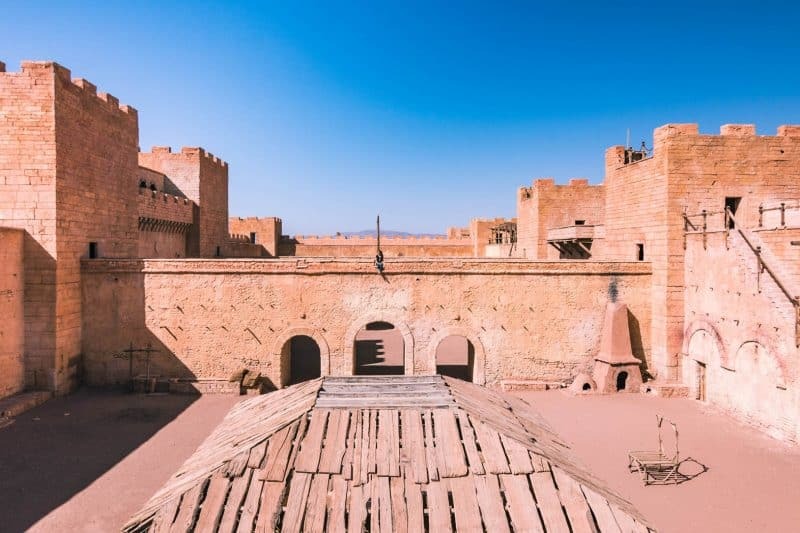 For those coming, there are so many other things to do in Ouarzazate beyond Ait Benhaddou but I guess I had to mention it anyway for my GOT fans and because, well, it’s really the main attraction in Ouarzazate! Saving the best for last, or least my favorite spot. 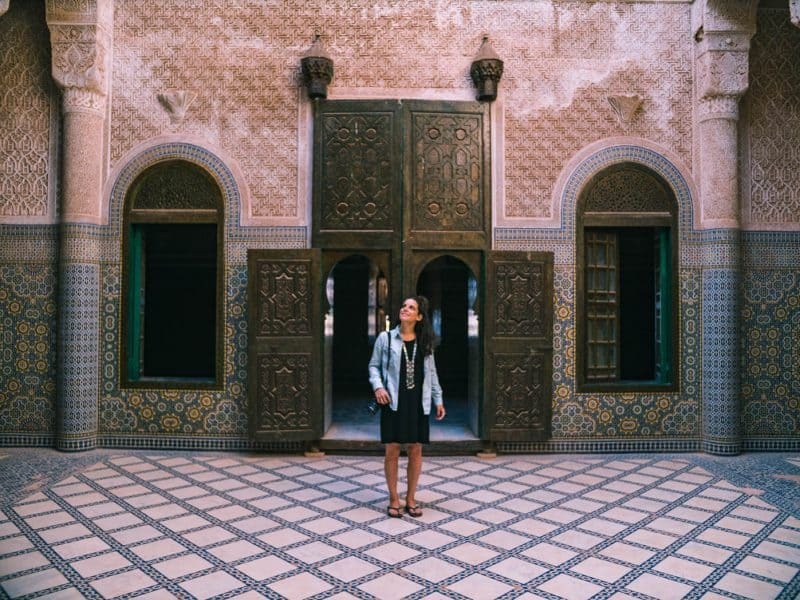 While this is one of the furthest things to do in Ouarzazate, it’s well worth the effort. An hour north of the city is the most beautiful Kasbah we saw. Firstly, we arrived at a very unassuming exterior. We wandered around and wondered where the spectacle was! Just as we were going to leave, we stumbled upon the entrance, which is towards the back and a bit hidden. 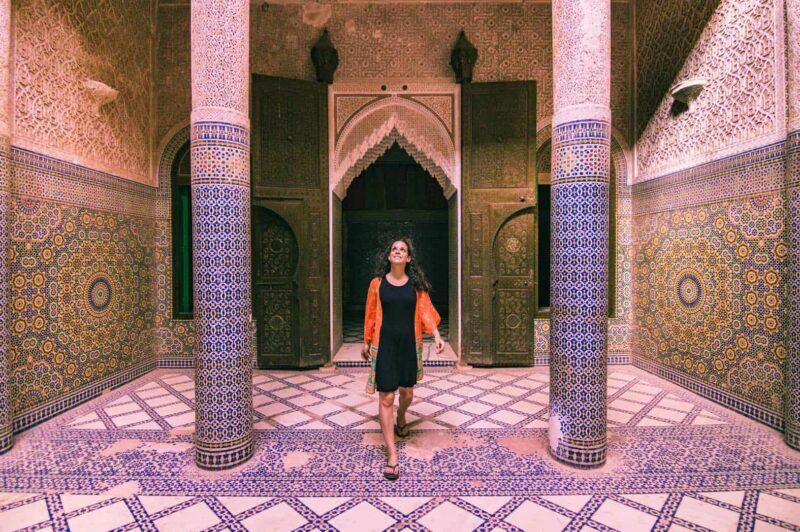 Kasbah Telouet was my favorite thing to do in Ouarzazate! We paid the entrance fee and wandered up the stairs into empty corridors and dusty rooms to finally arrive at THE room. Inside was a wonderfully restored and rich looking interior with tiled mosaics, elaborate doors, and gorgeous details around every corner. 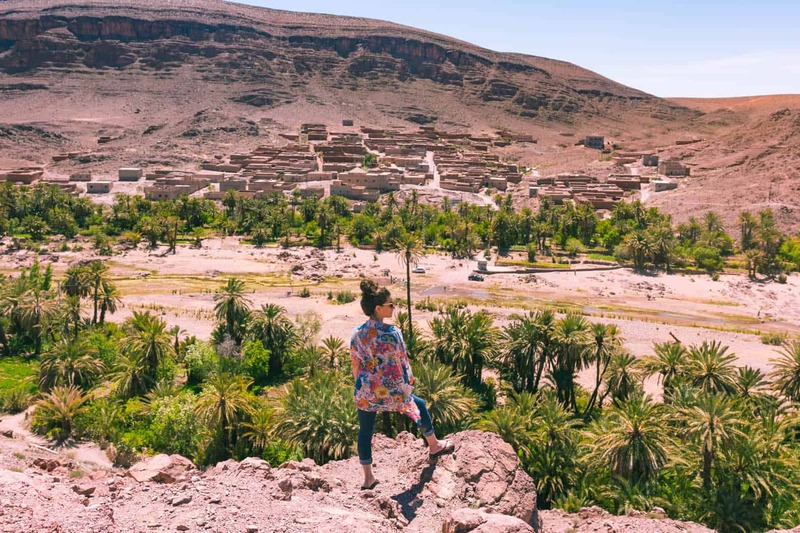 This was certainly our favorite thing to do in Ouarzazate and the drive here and back is also beautiful, full of viewpoints and villages inside the valley and strung up on mountainsides. 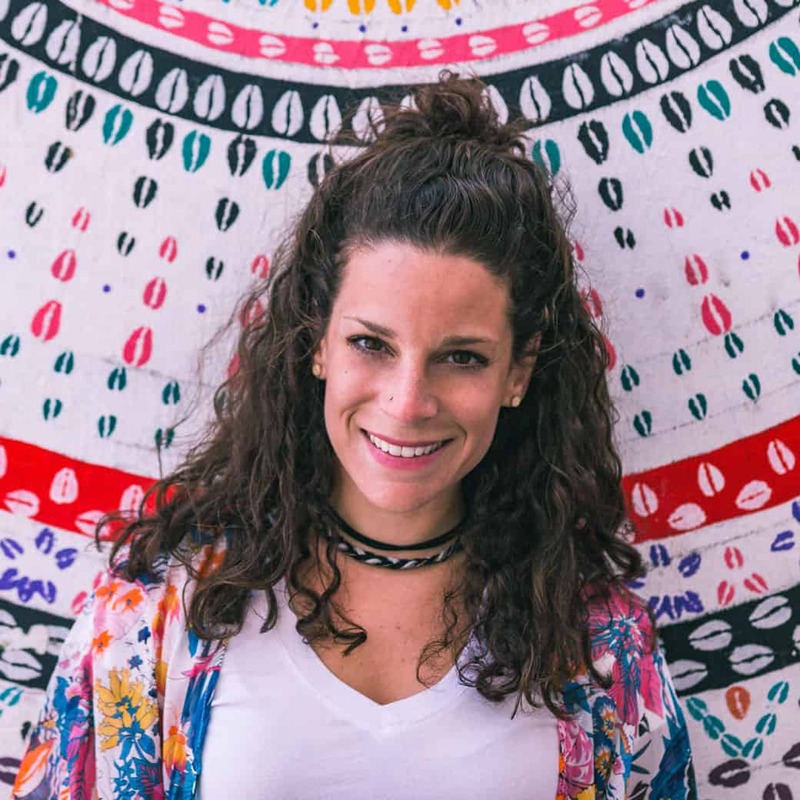 Note: The drive to Kasbah Telouet is easy but you will be flagged down to stop by children trying to get change off of you for the first few miles. There’s no obligation to stop and nothing is wrong with them. Keep driving. If you’re on a budget, Le Tichka Hotel is a good spot and for just a bit more Hotel Dar Kamar is also highly recommended. Just note that Le Tichka Hotel is actually called Ouarzazate Le Riad & Tichka Salam when you get there! The map has the correct pinpoint but the different names will through you off. Also, bonus points for this place having an incredible pool and a pool BAR with $2.50 beers. 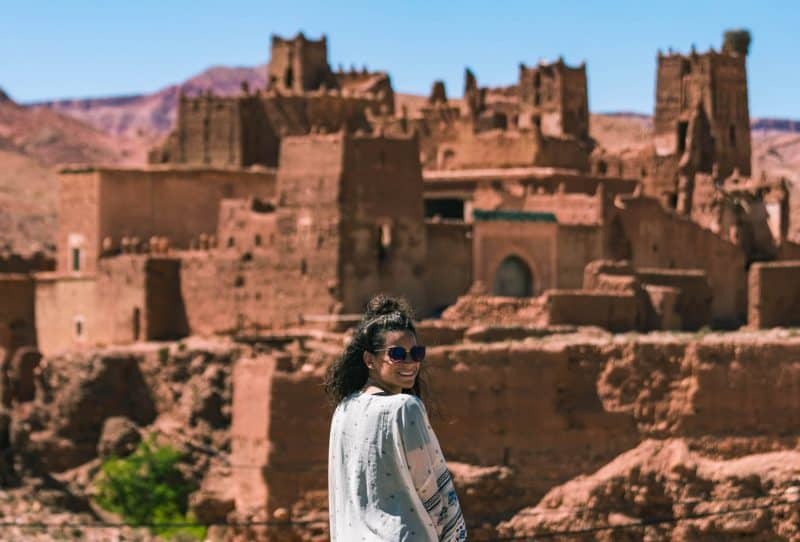 Which of the things to do in Ouarzazate are you excited to visit? Let me know in the comments!